Description - The slate pattern tile design is perhaps our most decorative appearing floor tile as it mimics the look of natural slate tile flooring in a variety of vibrant colors. This tile has a hidden interlocking design to guarantee a beautiful finish and a slip resistant surface. These tiles also help prevent fatigue during long periods of standing since they are flexible and help provide some cushion under foot. Material – Slate pattern tiles are constructed entirely of a proprietary blend of flexible PVC that guarantees a durable, vibrant, and attractive low cost floor tile solution. This material also ensures that the tiles are flexible in order to have the anti-fatigue flooring qualities often associated with rubber flooring but also the long wear life and chemical resistance associated with PVC tiles. Size – 18" x 18"
Recommended Uses – Slate pattern tiles have been used successfully as a tile flooring option in entrance ways, as basement flooring, in laundry and utility rooms, as garage flooring, in rec rooms and bathrooms, in kid’s play rooms, dens, offices, locker rooms, and any other place where a decorative and easy to install floor tile option would be useful. Snap a chalk line on the sub floor 18” from one wall in your room. Snap another chalk line on the subfloor 18” from an adjacent wall. You should now have a pair of perpendicular lines making an approximate 90-degree angle. Great for Living Rooms, Dining Rooms, Garages, Basements, and much more. Mold, Mildew and Stain Resistant. 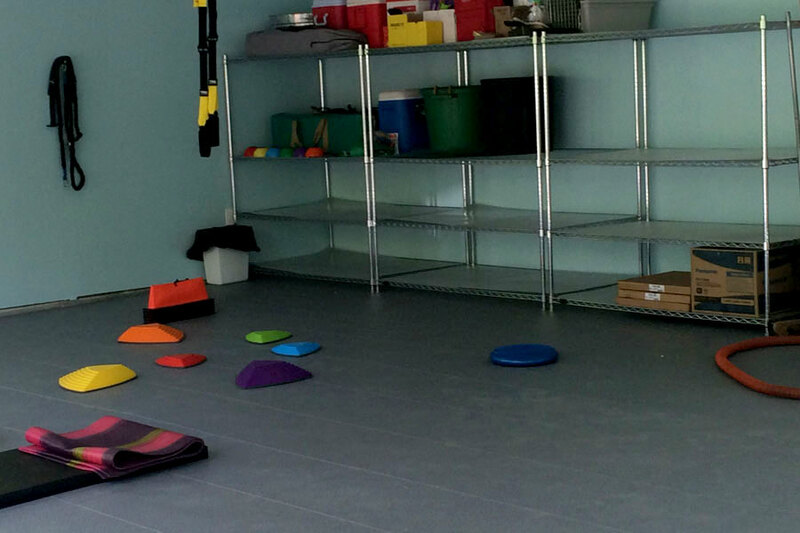 Could these tiles be used in a basement workout room with an occasional moisture problem on the floor? We previously had puzzle mat there and any small amount of water would wick under the tiles and because there was no air space would remain for a long time. 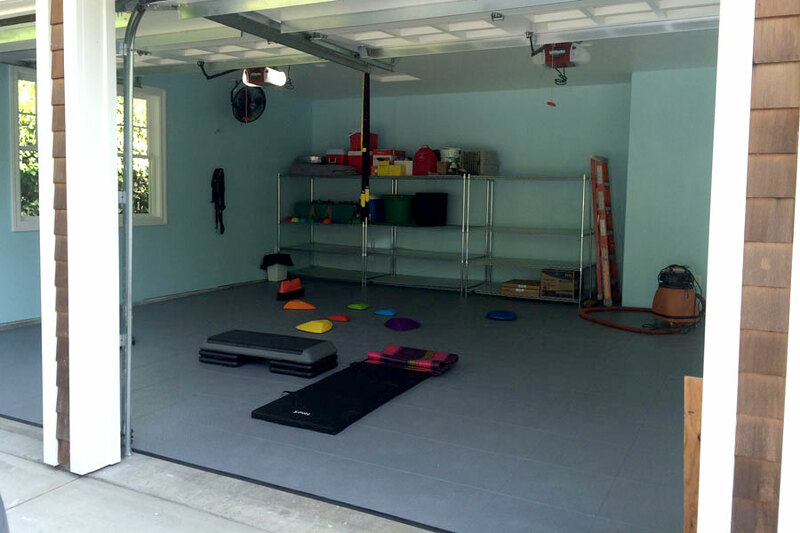 Our Slate Flex Tiles can be used as a workout floor in your basement with an occasional moisture problem. Since these tiles are non-porous like your foam tiles, you may still have the issue with there being moisture under the tiles. If the moisture if coming up from your subfloor, we would recommend sealing the subfloor to mitigate the moisture issue. What do you think about using these in a bathroom/kitchen? Our Slate Flex Tiles would be a great flooring option in a bathroom. 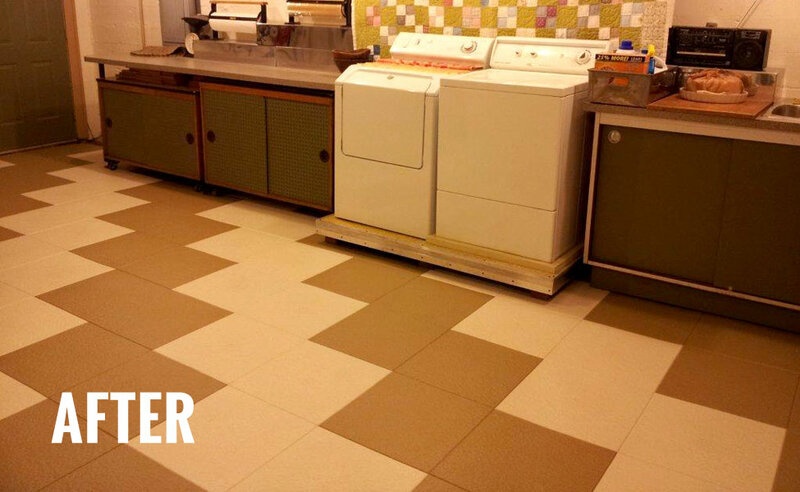 These soft PVC tiles are water-resistant and are very easy to clean and maintain. Unlike natural tile, these tiles are slip resistant even when wet and will not crack if and when a subfloor were to crack. These tiles are also mold and mildew resistant. Our Slate Flex Tiles can be installed anywhere in the country. These tiles work best when installed over a flat surface, but if there is some minor pitting, these tiles will install just fine. If there is significant pitting or other surface imperfections, leveling of the subfloor may be necessary. Is the floor strong enough for a pool table? Our Slate Flex Tiles are durable enough to withstand the weight of a pool table on to of them. 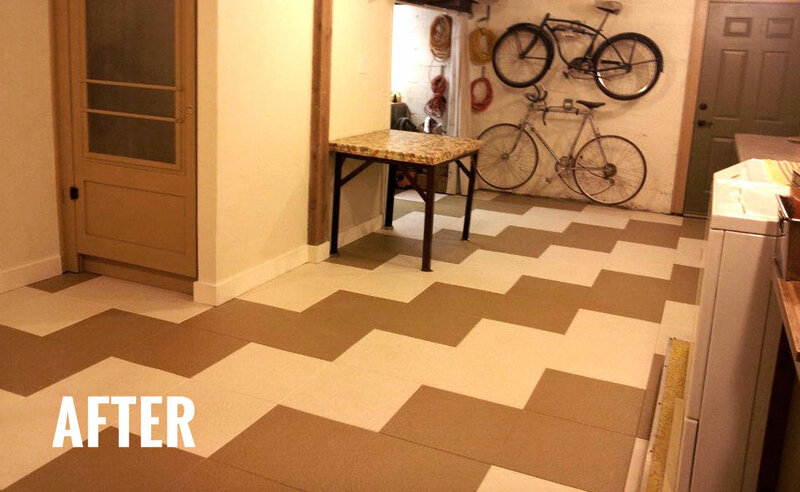 These tiles are constructed from flexible PVC plastic which is the same material used for piping in homes and business. These tiles were created for use in garages, but are stylish enough to be used throughout the home. Are these tiles waterproof if a basement were to flood? Can they be pulled up to dry the floor underneath and put back down, or are they not made for repeated installation? Our Slate Flex Tiles are non-porous and are water resistant, so if your basement were to flood, you could pull them up, clean them, let them air dry, and re-install them with ease. 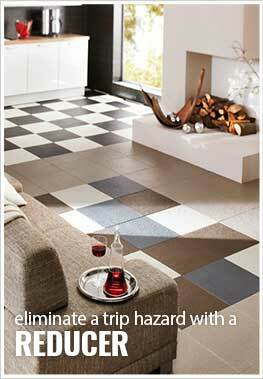 These tiles are interlocking tiles and can be removed and re-installed as many times as you own them. Easy to install....fun to use! I decided to turn my 3 car garage into a gym....but still have the ability to use it as a garage. Slate Flex Tile was the perfect choice for flooring. Two of us installed it in one day. 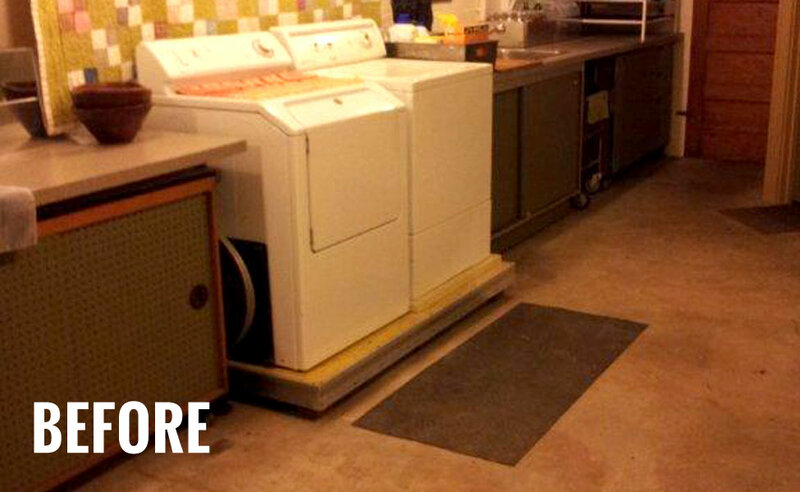 I needed a resilient and durable floor in my utility room. I have seven giant breed dogs (Newfoundlands and Great Pyrenees) and normal wear and tear on any other floor surface other than tile or slate is accelerated. These Slate Flex tiles went down impeccably and I put a bead of silicone sealant down along all the seams before tapping them in place. It provided a waterproof joint and excess silicone in the seam peeled right off after a few hours. The surface has provided good traction for the dogs and clean up is simple with just a damp sponge mop. I am seriously considering putting this resilient flooring down throughout the major traffic patterns in my house, it's that good!!! Here are some before and afters. I'm so pleased it looks and feels great !!! Perfect solution for a basement. 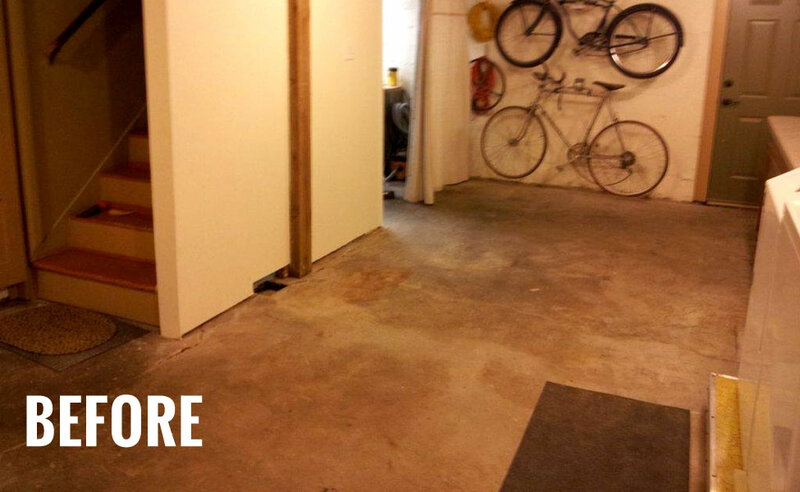 We are finishing a basement and wanted a durable, easy to install floor. Carpet is a no-no (been there done that), if you ever have any water problem, even a small one the carpet has to be pulled. Wood is a no-no for same reason. We preferred not to have to install a sub-floor so that left tile out --- and tile is cold in basement. A floor with some insulating factor is a great plus in a basement. We were going to go with a floating floor cork tile then stumbled on slate flex rubber floor. Met all the criteria, floating installation, some insulating factor and impervious to any water. Installed it in the bathroom yesterday. It was an easy installation, even in a bathroom where there was lots of cutting to fit around shower, toilet drain, etc. It looks great, not as high end as cork or tile would have looked but very good for what it is. We will be putting silicone sealant around the seam where the tile meets the shower, on all other edges we installed a baseboard on top of the tile to cover the expansion gap. I am giving the product a 4 (not a 5) because I do not yet have enough experience with how it holds up over time.